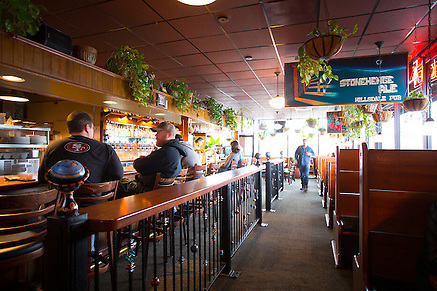 This pub displays the original painting of McMenamins "Hammerhead" logo by company artist Lyle Hehn! 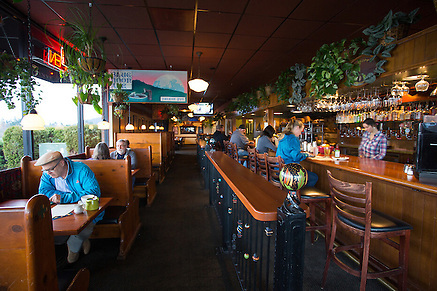 This pub in Portland provides welcome relief for shoppers and Interstate 205 travelers with its cozy interior, eclectic artwork and hearty menu. Weather permitting, dine and drink in our sidewalk seating area. McMenamins Mall 205 allows pets at our sidewalk seating only. Minimum drink purchase of $2 per personHere at Mall 205, menus are based on items from local and regional growers and producers (including Tillamook Cheese and Ice Cream, Pleasant Valley Pickles, Sheridan Fruit Company, Country Natural Beef and many others) in order to serve fresh pub fare. Try our house-made soups, salads and sandwiches.